LASIK surgery has a well-documented history of safety, and effectively eliminates patients’ dependence on glasses and contact lenses. Some variations of LASIK surgery are superior to others. Boston LASIK specialist Dr. Kornmehl feels that blade-free LASIK with the IntraLase laser has numerous advantages over traditional LASIK, including the fact that it is safer and better tolerated. He provides only blade-free LASIK surgery in his Boston facilities. The first step to a LASIK procedure is to create a corneal flap so the excimer laser can ablate the underlying corneal tissue. During conventional LASIK laser eye surgery, the corneal flap is created using a hand-guided, oscillating blade (microkeratome). The IntraLase method, also known as all-laser or bladeless LASIK, uses a laser to create the corneal flap. The IntraLase method, using the iFS femtosecond laser, was approved by the U.S. Food and Drug Administration (FDA) in 2001 and has been used in more the 5,000,000 procedures. The laser used in the IntraLase method moves back and forth across the cornea’s outer layers, emitting short, rapid bursts of laser light that create a series of minute bubbles at a determined depth. 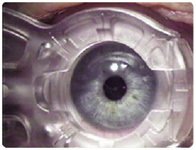 The tissue where the bubbles have formed is then gently separated, exposing the portion of cornea to be ablated. There are many advantages to blade-free LASIK as opposed to traditional LASIK. The precision of the femtosecond laser provides the surgeon and patient with peace of mind. 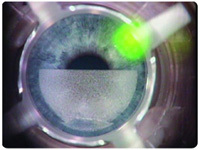 Creating the corneal flap with a computer-controlled laser instead of a microkeratome leads to more predictable flaps. The laser also provides more options to customize the flap to the patient’s specific need; the diameter of the flap and the angle of its edges can be pre-determined to exact specifications. This level of customization results in better visual outcomes. It is also noted that blade-free LASIK has a lower risk of complications than traditional LASIK. 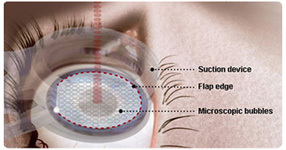 Most of the common LASIK complications are related to the flap creation process with the microkeratome – no matter how sanitary the operating room is or how skilled the surgeon, there is always a risk of infection and other complications. Plus, there is room for human error, even when a highly skilled LASIK surgeon performs the procedure. The risks are substantially reduced when the flap is made with the IntraLase laser. None of these complications have been encountered under the care of Dr. Kornmehl during or after any of his tens of thousands of procedures performed. Patients notice visual results and resume normal activities sooner after surgery because the healing time is accelerated. Additionally, there may be less risk of scarring or developing corneal haze. The IntraLase iFS laser can create a thinner flap than a microkeratome. This makes it possible to correct high amounts of nearsightedness, farsightedness and/or astigmatism. How long does it take to perform blade-free LASIK? Blade-free LASIK normally takes about 10 minutes per eye. What is the typical recovery time following blade-free LASIK? It usually takes 24 to 72 hours for vision to clear. Are there any side effects of blade-free LASIK? Patients may experience sensitivity to light, itchy eyes or a foreign body sensation in the eyes. Halos around lights are also common, immediately after surgery resolving within a few days with medicated and over-the-counter eye drops and ointments. How is blade-free LASIK different from Epi-LASIK and PRK? Blade-free LASIK involves the creation of a corneal flap, whereas with Epi-LASIK and PRK the outermost layer of corneal cells is separated from the underlying cells and regenerates after surgery. How do I know if I am a candidate for blade-free LASIK? Most people that qualify for traditional LASIK also qualify for blade-free LASIK. The best way to determine whether you are a candidate for blade-free LASIK is to schedule a comprehensive evaluation with Dr. Kornmehl. Bladeless LASIK is one of several vision correction options, including Boston cataract eye surgery, offered by Dr. Kornmehl. He conducts a thorough examination of each patient to determine the best refractive procedure. To find out if you are a LASIK Boston candidate, schedule a consultation with Dr. Kornmehl by contacting Kornmehl Laser Eye Associates at (877) 870-2010.